Proper seed starting is a topic WTOP's Mike McGrath feels obligated to cover thoroughly every season — and this is the perfect time of year to do it. Proper seed starting is a topic we feel obligated to cover thoroughly every season, and this is the perfect time of year to do so. First, it sounds like Bob was starting his seeds way too early. Forget trying to time things around your area’s “last average frost date.” Tropical plants like tomatoes and peppers can be set back severely if they’re exposed to nights in the mid-to-high 30s (and even the low 40s). These and other plants of summer should not go outside until night time temps are reliably in the fifties. That’s generally around May 15 or later in these parts. But don’t go by the calendar: Check the long-range forecast before you take your baby plants outside, and be prepared to keep them indoors a bit longer if any upcoming nights are expected to drop anywhere near or below 40 degrees. Time it like this: You want your plants to be six to eight weeks of age when they go outside, ideally between May 15 and June 1. Add a week up front for the actual germination of the seeds, and a few more days for wiggle room at the end, and we’re talking about a reasonable seed-starting start date of around March 15. Seeds that have not yet germinated don’t need light. They’re underground! It won’t hurt them, but it’s unnecessary. Heating mats are great for providing the exact amount of bottom heat that helps seeds germinate quickly — but after the seeds are up and sprouted, the mats should be turned off or they’ll keep the soil too warm and weaken the plants. The seeds need warm soil to sprout, but after they’re up and growing, the plants flourish with an indoor air temp in the sixties. Once your seeds have sprouted, your young plants want plenty of bright light — and that’s where most seed-starters fail. Bob out by Hagerstown reported that his plants from seed were coming up tall and leggy. That’s a very common problem, because young plants need much brighter light than most people suspect. The worst kind of light comes from a so-called “sunny windowsill,” a phrase that is actually Latin for “plants so tall and skinny they should play pro basketball.” The windowsill probably isn’t all that sunny to begin with, and it probably gets darn chilly at night. A pair of four-foot-long florescent tubes, as in a basic shop light fixture, are great for helping baby plants grow up short and stocky, but most people don’t keep the plants close enough to the lights. Use hanging chains to adjust the height of the fixture upward, or place books underneath the plants so that you can remove some of the books as the plants get taller, but always keep the tips of your baby plants within an inch of the tubes. You read that right, an inch — the light intensity, in lumens, of florescent lighting drops off dramatically after even a short distance. Fluorescent light is cool, so the plants aren’t harmed by being so close. Having the tips of your plants actually touching the tubes is much better than those tips being three inches away. Oh, and while a two-tube shop light is great, a four–tube fixture will give you garden center quality plants. Update: New LEDs in the size and shape of T-8 fluorescents — the modern, skinnier types — are now widely available, and their packaging says that they work in old school fluorescent fixtures. These LEDs will cost much less to run, and give off just as much light — and that light should remain just as bright year after year. Fill the same kind of small plastic containers that garden centers use, not old egg cartons or kindergarten-cute containers, with a light, loose bagged seed-starting mix, also known as “soil free mix,” “professional mix,” or “potting mix.” Stay away from garden soil. Avoid bagged soil-free mixes that contain chemical fertilizer or those creepy water-holding crystals. You may have to search for a clean seed-starting mixture: Espoma makes several nice ones, as does the mail-order supplier Gardens Alive, but independent garden centers should probably be carrying a nice selection. If they don’t, yell at them, and mention me. Sit the “soil” filled containers in a sink of water until they’re heavy and saturated. Place two seeds in each container. Cover the seeds with a little bit more mix. Cover the containers with clear plastic wrap, and put them on a heating mat or a warm table in your home. If a few days pass and no water drops are apparent on the inside of the plastic wrap, lift it up, mist the surface of the mix with plain water and then recover the containers. When the very first sprouts appear, immediately remove the wrap. The remaining plants will pop up over the next day or two. Turn off any extra heat underneath and immediately get the baby plants under bright light. An inch away from brand-new four-foot-long florescent or LED tubes is ideal. Run the lights for 16 hours a day. 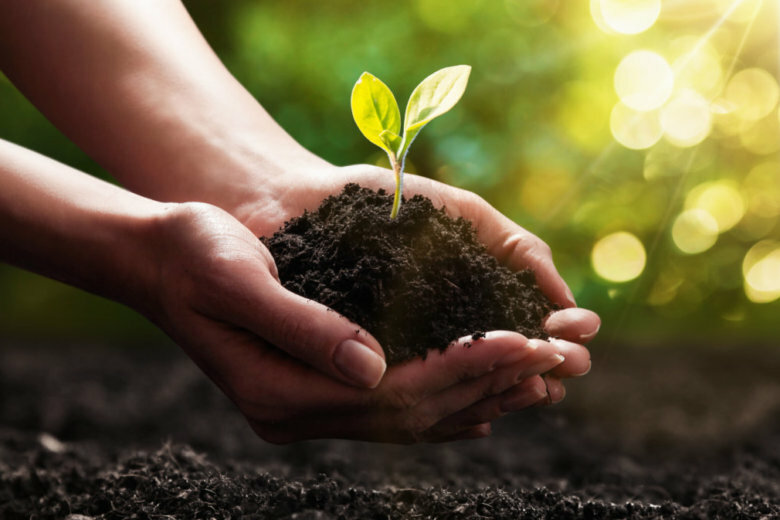 Gently feed the plants with compost tea or worm castings when they’re around four weeks of age. If more than one plant has sprouted in any of the cells, use a small pair of scissors to cut the tallest or weakest one off at the soil line around the three or four-week mark. Don’t yank it out. And don’t let it continue to grow, it will only diminish the health of the stronger plant. And finally, don’t despair if your seed-starting attempts yield poor results the first year or two. Nobody gets seed-starting right first time off the bat. It is much harder to raise little plants from seed indoors than to nurture big plants outdoors. The skill set is totally different. And the only way to get really good at it is to try — and fail — a couple of times. So do your best to follow the detailed instructions above. But be prepared to buy replacement plants without shame in the spring. You don’t want to start the season with weak sickly plants, and you’ll be sure to do much better at your seed starting the following year.